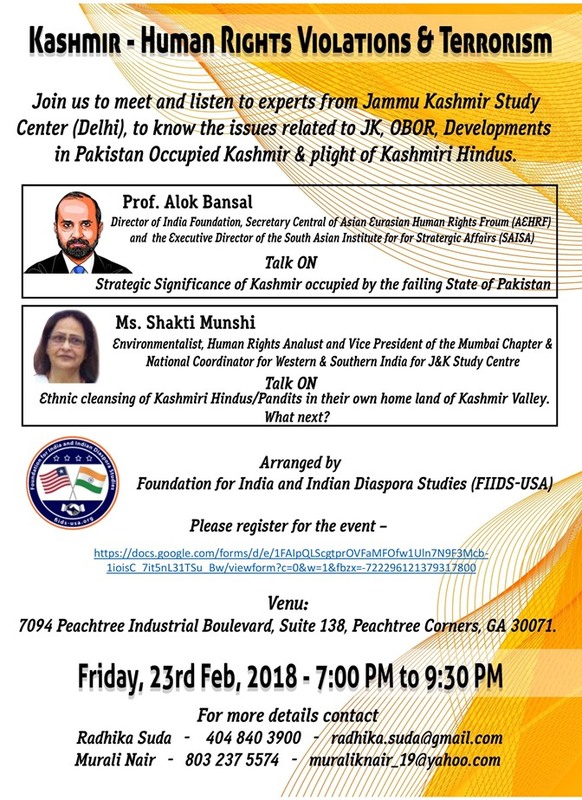 Join us to meet and listen to experts from Jammu and Kashmir study circle (Delhi), to know issues related to POJAK, OBOR and plight of Kashmiri Hindus. Prof. Alok Bansal: Director of India Foundation (New Delhi), the Secretary General of Asian Eurasian Human Rights Forum (AEHRF), an organisation accorded ECOSOC status by the UNESCO and the Executive Director of the South Asian Institute for Strategic Affairs (SAISA). He is also facilitator of India Policy Group (IPG) on Afghanistan for Track II Dialogues by Friedrich Ebert Stiftung. He has been the Executive Director of the National Maritime Foundation (NMF), a New Delhi based think tank for two years, a Senior Fellow at the Centre for Land Warfare Studies for three years and has worked with the Institute for Defence Studies and Analyses (IDSA), New Delhi for over five years. Ms. Shakti Munshi: Environmentalist, Human Rights Analyst and Business Person. Independent Director on the Board of Dedicated Freight Corridor Corporation of India Ltd ( Railways ). Vice President of the Mumbai Chapter & National Coordinator for Western & Southern India for Jammu Kashmir Study Centre. � A member of Asian-Eurasian Human Rights Forum. Ex-Permanent Invite Member of the Board of the Kashmiri Pandit Association.